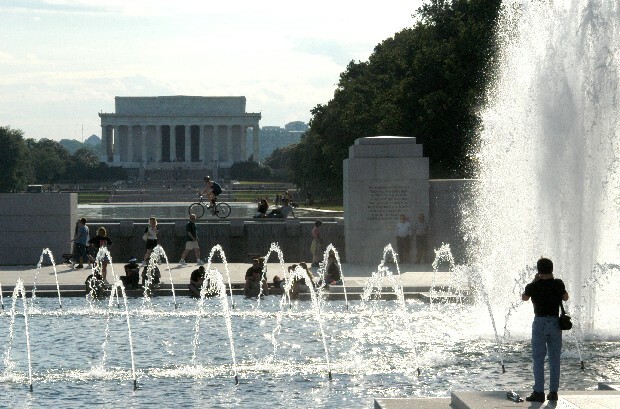 I remember when the WWII Memorial was still under construction. I remember the cranes lifting the towers and stone before I even realized what they were building. I make it down to the WWII Memorial as often as I can, about once every three days. I didn't make it very close to the memorial this Memorial Day Weekend though, no ticket for the opening ceremony. One of the side effects to all this "remembering" and Memorial Day is a lot of talk on the bus and at the sidewalk, mostly pertaining to WWII. If some dude had a great uncle that served in WWII they have recently become battlefield experts. I couldn't help overhearing two middle-aged men on the bus loudly going over details of the First World War under the impression they were discussing WWII! God save our country, we're morons!